Just to say thank you for signing up at Golden Hat Bingo, all nee players receive £1 free. Then, as soon as a first deposit of £10 is made, it is matched with a free bingo bonus of £10. Using Virtue Fusion software licensed in Alderney, Golden Hat Bingo specialises in online UK bingo. Games are operated in English and the British Pound is the currency of choice. 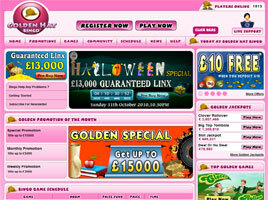 The web site, which is owned and operated by Golden Hat Games, was recently acclaimed as the “Best New Site of the Year, 2009” by Which Bingo. No download is required to join in the action here. At any given time, roughly a thousand players can be found online. The games offered at Golden Hat Bingo cover the entire gamut of bingo opportunities, including 75-ball and 80-ball rooms along with the ever-popular 90-ball bingo games. A number of free bingo games are plugged in with these, and there are slots, scratch cards, and number games to play as a complement to the ongoing bingo fun. Indeed, Golden Jackpots slots are a big part of the focus on winning at Golden Hat Bingo, with 19 different progressive games to choose from. At last glance, the top prize on Clover Rollover had surpassed £3.5 million—one of the biggest progressives on the Internet. Others range from Wintery Wonderland at just over £75,000 to Big Top Tombola at well above £1.3 million. Of course, bingo is the primary focus here, and the Jackpots are just as attractive, with high valued cash pots from £500 to more than £77,000 rooted to numerous bingo games. For example, the Pressies Room offers free 90-ball bingo with a jackpot named Cash Cow worth £2,500; it’s open on all days of the week from 11am to 6pm GMT. Meanwhile, Joker Jackpot puts in excess of £21,000 up for grabs each day in J-pattern games played from noon till midnight. Those who love speed games will find them in the Gold Rush 90-ball room between 4pm and 8pm daily. There are 75-ball patterns galore in the Wags Club from 10am to 3pm, and the Bingo Makeover room offers five ways to win each game 24 hours a day. The place for 80-ball bingo is the Café’s 80 room, where the competition runs non-stop between 9am and 9pm. It has a big progressive prize of its own, too—the Espresso Xpress—in addition a fixed jackpot game called Mocha Xpress. Tickets are priced from 5p up, with most scheduled games falling in the £0.10~£0.25 range. With a dozen rooms to choose from, there’s almost most always a suitable opportunity starting. The chat hosts are approachable and easy to talk to (lots of Gemini’s), and nearly two dozen chat games, from Golden Hug to Movie Partners, keeps the pace lively between calls. Redeposits are also rewarded at Golden Hat Bingo. Each and every day, any player’s first deposit of the day between £20 and £100 is matched with a 25% bingo bonus match. And there is no limit on the number of days this redeposit bonus may be claimed. Golden Hat Bingo also offers daily, weekly, monthly, and seasonal special promotions. These range from free slot play and free bingo tickets to leader board races, buy-one-get-one-free sessions, cash-back opportunities, and extra jackpots. Exclusive promotions and competitions are offered by the dozen, too, including weekly tourneys and an on-going “Refer-a-Friend” offer of £5 free for each referred friend who makes a deposit.